Join us for our 2014 Holiday Benefit! We’re thrilled to announce our 2014 Holiday Benefit! The event will be held on Friday, December 12. 100% of proceeds from your hair services that day will be donated to Feeding America. You will also have the opportunity to take part in our giving tree. Some of our favorite Chicago businesses have donated great items to the benefit. Here’s your chance to donate to a great cause and get something in return! 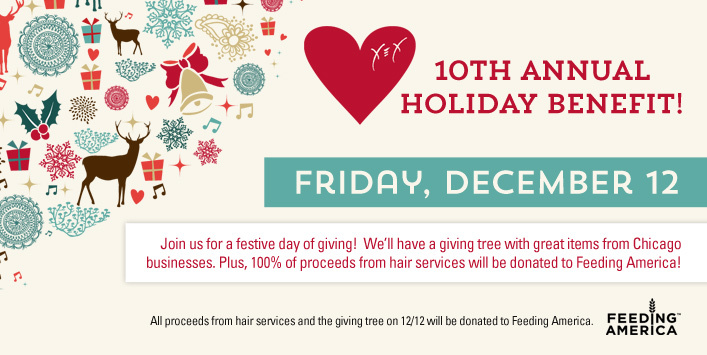 Book your appointment for Friday, December 12, to be a part of this festive day of giving.